Iskandar Malaysia is confident that the region’s inflow of investments from domestic and foreign investors will continue to grow from this year onward and this will enhance the whole eco-system in Iskandar Malaysia as the spill-over effects will have a higher impact on the region’s economy and the Rakyat. “The progress Iskandar Malaysia has steadily charted since 2006 has been truly spectacular and will be key in helping Malaysia to reclaim its leadership as the ‘Asian Tiger’. As the agency driving the development of Iskandar Malaysia, I remain optimistic on the role and responsibilities of IRDA in supporting the development of the State of Johor and the nation’s agendas,” said Prime Minister Tun Dr Mahathir Mohamed, who is also Iskandar Regional Development Authority’s (IRDA) Co-chairman, during IRDA’s 24th Members of Authority (MoA) meeting. Acknowledging the positive and impactful results that Iskandar Malaysia has achieved, The MoA has approved a proposal to extend the area of the Iskandar Development region bringing the total area from 2217 km square to 4749 km square. They include parts of the districts of Kota Tinggi, Kluang and Pontian. According to Datuk Ismail Ibrahim, Chief Executive of IRDA, the MoA believes that with the larger area of coverage, Iskandar Malaysia should be able to offer more land for development at affordable cost, and at the same time bringing modern agriculture as one of its new promoted sectors. In terms of economic growth, Iskandar Malaysia recorded committed investments of RM32.23 billion in 2018, where RM22.03 billion represent investments that have been realised. 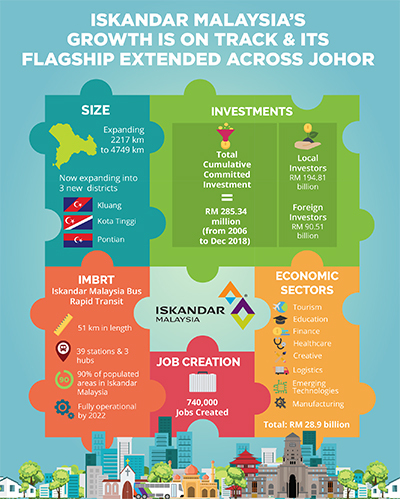 This contributed to the total cumulative committed investment of RM285.34 billion from 2006 to 31st Dec 2018. The MoA also supported Iskandar Malaysia’s strong global supply linkages by becoming the home for the first ASEAN Industrial Hub. To date, Iskandar Malaysia has created about 740,000 employment opportunities, of which 15% are skilled positions. However, there are still certain vacancies that are not filled by Malaysians, especially by the local youth. Therefore, more incentives need to be done to attract talent here. With regards to household income, one of the ways to help the Rakyat is to have an affordable and integrated public transportation system such as Iskandar Malaysia Bus Rapid Transit (IMBRT) system where comfort, safety and affordability will go a long way in ensuring that 90% of the population in Iskandar Malaysia have access and benefit from it. Next articleACCUMULATING WEALTH – From Bear to Bull – what are the lessons?